Amtrak's safety record has become the focus of the inquiry into Monday's fatal train crash. 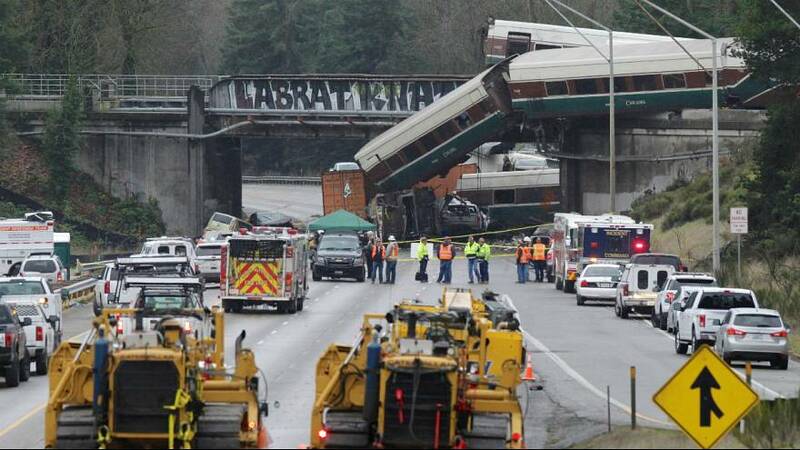 At least three people died when the new express service derailed on its way to Seattle. Investigators say it was travelling at nearly three times the speed limit. "Preliminary indications are that the train was travelling at 80 miles per hour in a 30 miles per hour track.," said Bella Dinh-Zarr, spokeswoman with the U.S. National Transportation Safety Board. "We are not determing a probable cause of that accident, nor we will speculate on what may have caused the accident." Survivors say the train's carriages rocked and rolled as it took a bend fast before careering off a bridge onto a busy highway. Seven vehicles, two of them lorries, were hit. Several motorists were hurt but none died. Among the 72 people taken to hospital, at least ten are said to be seriously hurt. Officials say it could take months before the investigation is concluded. Just last month, the chairman of the NTSB issued a scathing critique of Amtrak's culture, saying a future breakdown was likely. "Amtrak's safety culture is failing and is primed to fail again, until and unless Amtrak changes the way it practices safety management," NTSB Chairman Robert Sumwalt said in a statement on Nov. 14. Seattle stolen plane: Suspect's family mourn "loving son"